It has been too hot to get on the road, so I have been staying at home for a couple of days. I have been doing the obligatory laundry, dusting and vacuuming and lots of cooking. Today I prepared a couple of old favorites: Stuffed Green Bell Peppers with Cheese Sauce and Vidalia Onion Pie. When I was pregnant with my second child (1980), I entered a recipe contest sponsored by a local newspaper. To my surprise I won the summer vegetable category for my Bell Pepper recipe. The dish had its beginning in a huge paper sack of the largest bell peppers I had ever seen. My husband, an Exxon employee at the time, bought the peppers from a colleague who had a garden. He purchased them for $1.50. Thinking back on this makes me sad that I had to pay $1.00 for two peppers at the grocery yesterday. My chore was to "do something" with all those peppers! Thus the recipe. I even had a picture of myself in the newspaper for winning the contest! I am sure there was some sort of prize, but I can't remember what it was. What I do remember is a feeling of accomplishment. I usually double this because it is just as easy to make 10 stuffed peppers and freeze some for consumption during the cold winter ahead. 2. Spoon mixture into peppers. Freeze at this point or bake for about 45 minutes at 350 degrees. Add a little liquid to the bottom of the pan to keep peppers from drying out as they bake. Cover for the first 30 minutes with foil and then remove foil and finish baking. Melt 2 tablespoons butter and stir in 2 tablespoons flour. Gradually add 1 cup milk and stir constantly until thickened. Add cheese (whatever type you like) Prepare this at serving time. Don't freeze. Serve sauce over baked bell peppers. This recipe seems like a lot of trouble, but it is worth the effort! 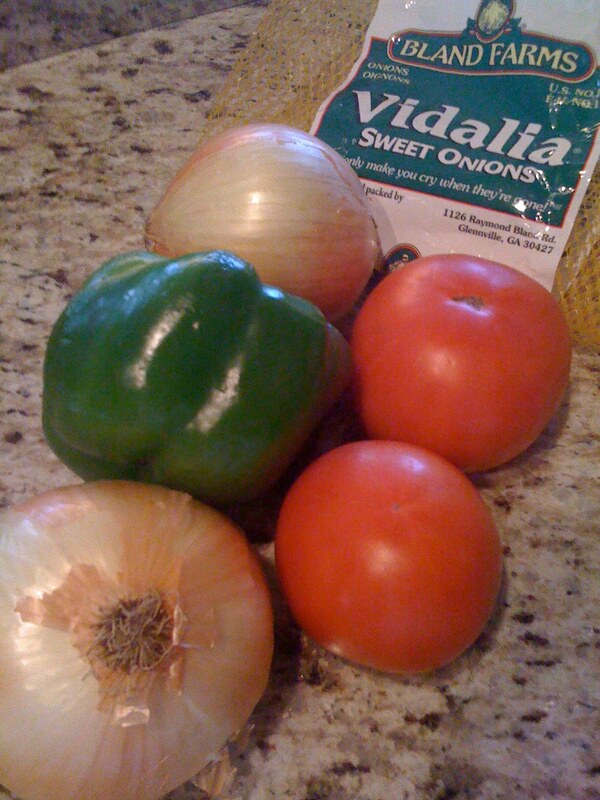 Another sign of summer in Louisiana is the appearance of Vidalia onions in the grocery store. These onions are a large, sweet, white variety grown in Georgia. They first made an appearance on the market in the 1930's. In 1986, the Georgia State Legislature passed a law that only onions grown in certain counties of Georgia can be called "Vidalia Onions." The brand I selected was Bland Farms, the producer responsible for about one third of all Vidalia Onions marketed in the states. (www.blandfarms.com) I normally buy a large package and use them for several weeks in my summer suppers. 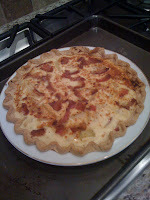 My friend, Jo, gave me a recipe many years ago for an onion pie that was very simple and easy to whip up as soon as the Vidalia onions made an appearance. Over time I have doctored that recipe until I had the seasonings adjusted just right for me and my husband. 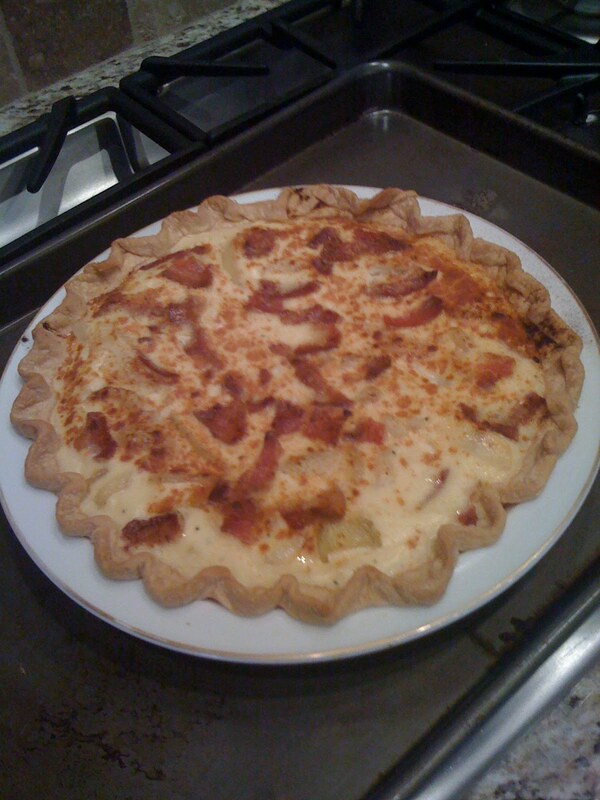 Here is the latest incarnation of the Vidalia Onion Pie that I prepared for tonight's supper . It can be served as a main dish or as an accompaniment. It would even be good for breakfast! 1. 1. Sauté the onions in the butter until they are clear and golden in color. 2. 2. Preheat the oven to 325 degrees. 3. 3. Place onions in the prebaked pie crust. 4. 4. Combine remaining ingredients except for bacon and Paprika. Whip with a wire whisk until bubbly. Pour mixture over onions. 5. 5. Top with bacon and sprinkle with paprika. 6. 6. Bake for 23 minutes or until a knife comes out clean. Cool slightly before slicing into 6 servings. No summer meal is complete without sliced fresh tomatoes. We are growing some in pots on our patio, but those are not ripe, yet. We were able to purchase some Creole Tomatoes at a local produce market. They were from Liuzza Farms in Tickfaw, LA. (www.louisianastrawberries.net) The Creoles are an heirloom type that are medium in size and large on taste. These are only grown in Louisiana and in 2003 the State Legislature declared them the Louisiana State Vegetable. 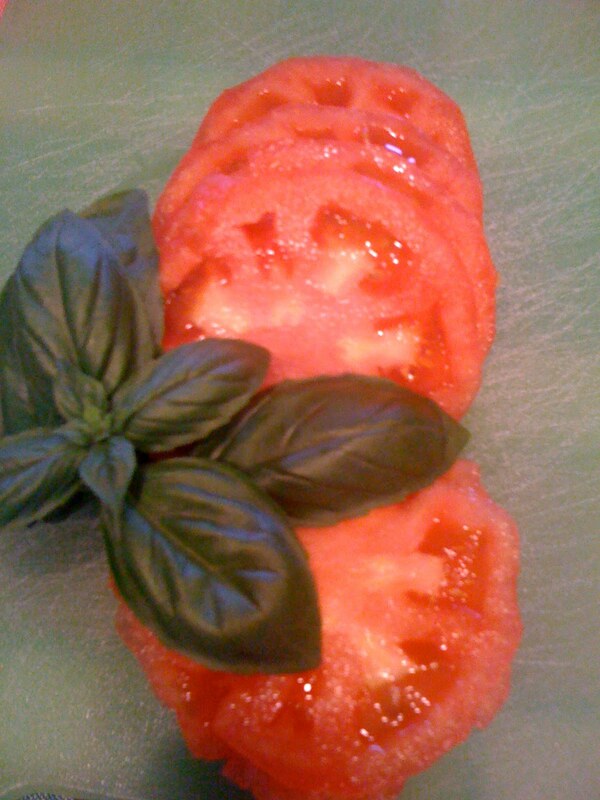 I have fresh basil growing, too, and I love to serve the sliced tomatoes with julienned fresh basil leaves. It's also tasty to serve them Caprese style where they are sandwiched with fresh water mozzarella and a dressing of olive oil and balsamic vinegar. I have a cherished bottle of Vanilla Fig Balsamic Vinegar and it is my favorite. I also have a bottle that we bought in Florence, Italy last summer. We use it sparingly. It's evokes such good memories. When purchasing balsamic vinegar, look for the Modena type. Aged Balsamics are the best tasting and they can be pricey. Such a small amount is needed for taste that it is a good idea to get a good one that you like. Think beyond the supermarket on this purchase. Fresina's Italian Specialties (http://www.fresinas.com) in Baton Rouge has some excellent choices in Balsamic vinegars. I recommend the varieties that they stock. T If it's too hot to get out on these summery days, stay home and try the recipes above and think: SUMMER!